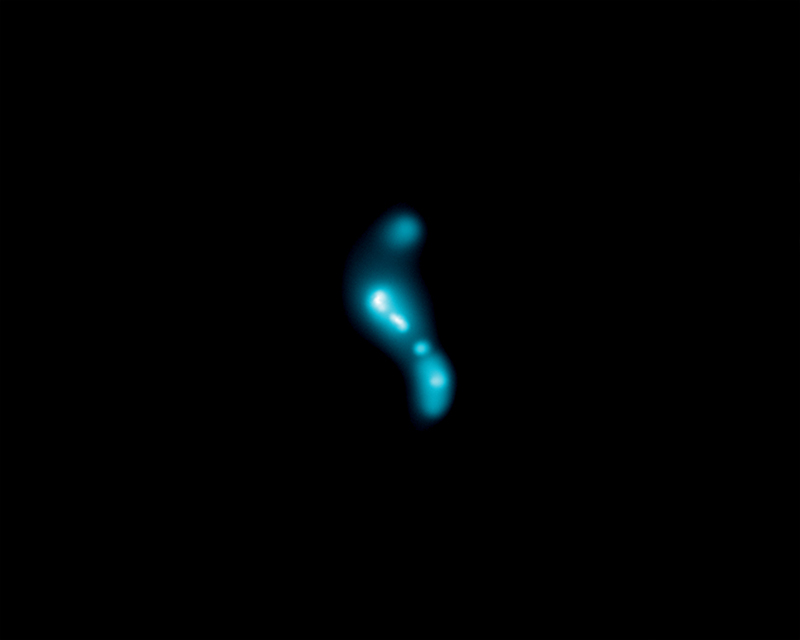 R Aquarii is a system containing a white dwarf and a “Mira” variable red giant in orbit around each other. Over the 17 years of Chandra’s operations, the telescope has observed the R Aquarii system many times. This new composite contains optical data (red) and X-ray data from Chandra (blue). Chandra data helps astronomers better understand how this volatile stellar pair interacts with one another. In biology, "symbiosis" refers to two organisms that live close to and interact with one another. Astronomers have long studied a class of stars — called symbiotic stars — that co-exist in a similar way. Using data from NASA’s Chandra X-ray Observatory and other telescopes, astronomers are gaining a better understanding of how volatile this close stellar relationship can be. The red giant star has its own interesting properties. In billions of years, our Sun will turn into a red giant once it exhausts the hydrogen nuclear fuel in its core and begins to expand and cool. Most red giants are placid and calm, but some pulsate with periods between 80 and 1,000 days like the star Mira and undergo large changes in brightness. This subset of red giants is called "Mira variables." The red giant in R Aqr is a Mira variable and undergoes steady changes in brightness by a factor of 250 as it pulsates, unlike its white dwarf companion that does not pulsate. There are other striking differences between the two stars. The white dwarf is about ten thousand times fainter than the red giant. The white dwarf has a surface temperature of some 20,000 K while the Mira variable has a temperature of about 3,000 K. In addition, the white dwarf is slightly less massive than its companion but because it is much more compact, its gravitational field is stronger. The gravitational force of the white dwarf pulls away the sloughing outer layers of the Mira variable toward the white dwarf and onto its surface. Rodolfo ("Rudy") Montez of the Harvard-Smithsonian Center for Astrophysics (CfA) in Cambridge, Mass, presented these results at the 230th meeting of the American Astronomical Society in Austin, TX. His co-authors are Margarita Karovska, Joy Nichols, and Vinay Kashyap, all from CfA. NASA's Marshall Space Flight Center in Huntsville, Alabama, manages the Chandra program for NASA’s Science Mission Directorate in Washington. The Smithsonian Astrophysical Observatory in Cambridge, Massachusetts, controls Chandra’s science and flight operations. Scale Image is 4.2 x 3.4 arcmin (About 0.86 x 0.70 light years). Coordinates (J2000) RA 23h 49m 34.6s | Dec -15° 17' 04"
We here in Holland the Netherlands appreciate it each day. However, I would like to put one little question. How far approximately are the two stars in this R Aquarii system from each other please? Thanks Willem, The Hague, the Netherlands. About 710 light years from Earth. X-rays from Chandra X-ray Observatory optical data from other telescopes..
About 0.86 x 0.70 light years.